Hello there, my name is Adam Tolman, and I am the Director of Product Design here at Lendio. That fancy title basically means I am the principal designer for all of our web and mobile applications – from doing research and validation on to interface and interaction design. As I see it, my primary responsibility is to empathize with the small businesses that use our services and be the chief evangelist for creating products that contribute to an excellent customer experience. 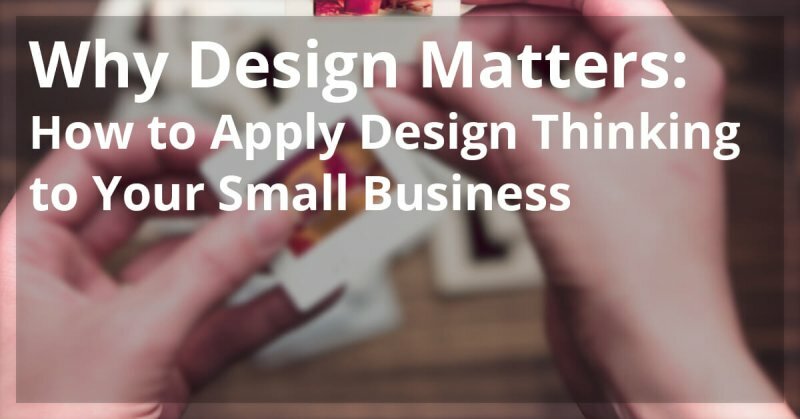 I’d like to share with you some thoughts on why design should matter to your small business, and how you can differentiate yourself amongst your competitors with great design. Whether your business offers new-fangled widgets or provides a niche service, applying design thinking to your business can pay large dividends. We live in a world where “design” has become the next big thing – both in its perceived value as well as its actual value. Design is becoming the zeitgeist of our generation, and it could be argued that at no other point in human history has design been so valued – and important – in both our personal and professional lives. From the apps you use on your smartphone (and the smartphone itself), to the tools and utensils you use in your home (and your home itself). From the cars we drive to the food we buy. From the clothes we wear to the computers we use. All of those things were designed. They were created for you by their creators with the hope that they would provide some kind of value to your life. Often times these hopes live unfulfilled. The next time you’re filling up your gas tank, look at the interface of the pump – that was designed, for better or for worse. Did it provide value? How did you interact with it? Did it make the process easy or save you time? Could it have been done better? The first step in recognizing how design can effect your business you must start noticing it. Open your eyes and you’ll see it all around you. In fact, let’s conduct a quick experiment. Think about the most useful tools you use daily – would you say that they’re designed well? Why or why not? The Merriam Webster dictionary defines design as “to plan and make something for a specific use or purpose”. There are two keywords in there that I believe really ring true: plan and purpose. So design is taking time applying disciplined thought with the intention of accomplishing a goal; to create something that has meaning and exists for a specific reason. Okay, let’s be less verbose shall we? Perhaps the easiest way to understand design is simply calling it problem solving. First, identify a problem that affects people; second, create a solution that solves that problem. Boom: design. All design is meant to solve a problem for a person. Design is planned purpose. Now, let’s talk about what design is not. Good design is not subjective, it should be true to everyone. Design is not just color, form, light, or texture – design is not simply visual or tactile, it’s functional. Design is not about making things pretty – it’s not decoration. Design is much, much more. Most successful companies today are paying large of amounts of money and dedicating many teams to designing products and services that contribute to a better customer experience. The really successful ones apply design thinking across all departments. The poster child for this movement would be Apple, a company that has prized good design in every aspect of their business. They were doing this before everyone else and finally people started taking notice. Something once seen as superfluous is now necessary. Design thinking is a methodology for applying design principles to every layer of your business. As Tim Brown, the author of Change By Design, puts it, “Design thinking is a methodology that imbues the full spectrum of innovation activities with a human-centered design ethos. By this I mean that innovation is powered by a thorough understanding, through direct observation, of what people want and need in their lives and what they like or dislike about the way particular products are made, packaged, marketed, sold, and supported.1”. Simply put, design thinking is about putting people first, understanding their needs in light of your product or service, and making sure your business strategy is sustainable with this in mind. It doesn’t matter whether you provide a service or make a product – good design matters, and it could really change how your business interacts with customers. It’s becoming clear that those businesses who do not apply this kind of thinking will soon be left behind. Identify the problem(s) your business trying to solve: Is it a problem a lot of people are having? How, specifically, are you solving it? Is there a lot of opportunity in the market? You may have gone through these exercises before, but it’s something you should do often, making sure you truly present real world value for your customers. Get to know your customer – really, really well: You can’t really know if you’re solving real problems unless you know the people you’re solving them for. Go visit your customers where they live and work. Get to know them really well; their environment, hopes, motivations, fears, and goals. Develop real empathy for them – by doing so you’ll naturally create better products and services. Determine your customer’s experience with your product or service: It’s going to be hard for you to grow and succeed without knowing if your product or service is solving a problem for your target customer. Validate the success (or failure) of your business by doing quick surveys, follow up calls, and usability testing. What do they like? What do they dislike? Use this information to iterate and improve. Start small and become more agile: Get used to the idea of testing frequently, gathering data, and iterating quickly. Don’t try and do it all at once either – perhaps try it with a small part of your business and then slowly grow it over time. Validate new ideas with your customers: Constantly think of new ideas and unique features and then discover the value of them by creating simple prototypes (or just a presentation) and have them validated by your customers. By doing this often, you’re able to grow your product or service more sustainably. By applying just a small amount of design thinking to your business you’ll be amazed at what kind of new and relevant information you’ll uncover – information that will effect your bottom line. Continue to spot good (and bad) design in the real world, value your customer’s experience above all else, and discover and validate ideas quickly. I’m convinced that over a short amount of time you’ll see positive effects on you and your business. Adam leads the product design at Lendio and has been doing human-centered design for nearly 10 years. He is a relentless advocate for Lendio’s customers, and is constantly researching, testing, and identifying ways in which to make products as beautiful, simple, and easy-to-use as possible. See Adam’s profile on LinkedIn.